Fancy some roast peacock and whale’s vomit? Maybe not, eh! Medieval food and drink probably wouldn’t tantalise our modern tastebuds. In the Medieval period, though, these strange dishes would have been delicacies. Nobles living in a Medieval castle celebrated important occasions with grand feasts, filled with unimaginably rich foods. At the other end of the scale, everyday food for a medieval peasant would have been much more boring. How would you feel about surviving on dry, yeasty bread and pickled fish every day? Many people’s diets lacked nutrients, and they developed scurvy. I guess you’d have had something to eat, though. Because in Medieval Europe, famine and starvation was common. If you were a medieval peasant, your food and drink would have been pretty boring indeed. Most days, you’d have eaten a lot of thick, dense, yeasty bread, usually made from rye or barley – rather than wheat. Alongside this, you might have ‘enjoyed’ root vegetable stews (‘pottage’), or a thin gruel-like porridges, made from oats or grains. In late Medieval times, people often ate these soups from ‘trenchers’ – a dish made from made from hollowed hunk of dried bread. Some peasants would have caught freshwater fish, such as trout from the village pool, to supplement their boring diets. If you were lucky, you might have a few chickens, a pig and perhaps even a sheep to your name. This could mean a steady supply of eggs. If you butchered the pig or the lamb, you’d need to heavily salt or pickle the meat to preserve it over the winter. If you were really lucky, you might have had a cow: but cow’s milk, as it went bad so quickly, was reserved for children, or the sick, to drink that same day. Medieval nobles would have enjoyed a diet of rich, heavy foods that might turn your stomach today. They’d have eaten much more meat than Medieval peasants, but it would tend to be game such as venison, rather than beef. Medieval nobles tucked into pretty much any bird that they could get their hands on – swans, geese, partridge, ducks, peacocks, and even song birds and sparrows. Even animals we’d never eat today – such as hedgehogs and badgers – might make it onto the menu. Some Elizabethan feasts even included whale and whale vomit (a substance called ambergris). A true Medieval castle banquet would have been a gut-busting affair, with huge wooden tables sagging beneath a cornucopia of rich foods and wine. Because famine was all too common – and sometimes even the rich would have to tighten their belts – it was a time for celebration and gluttony. Guests would have gorged themselves on tens-of-thousands of calories worth of food, and some guests would even eat until they vomited! Minsterels, musicians and clowns would have entertained the diners as they idled over their feast. If you were a Medieval peasant, what would you drink? Well, literally gallons of ale. It’s a very rough estimate, but it’s thought that a Medieval peasant in England might drink 60 gallons (about 300 litres) of ale a year. Medieval people weren’t drunk all the time, although maybe that would have made life a bit more bearable! Their ale was quite different to modern beers – it was fermented differently, and had a very low alcohol content. Although Medieval people drank ‘spring water’, it would generally have been polluted. People probably preferred to drink ale because it tasted better, and contained more energy. (The connection between disease and dirty water wasn’t made until much, much later, so it’s unlikely Medieval people drank ale as it was ‘safer’). Medieval people in Britain also imported wine from the vineyards of France or perhaps Italy. In Northern Europe, where it’s too cold to cultivate grapes, wine was a high-status drink. But in Southern Europe, it would have been drunk by everyone. Wine was commonly believed to be good for the digestion and was also thought to boost your mood! Another interesting Medieval beverage was mead. Mead was a sweeter drink, brewed from fermented honey. It was often heavily spiced, and would likely taste very strange to us today. Many fruit and vegetables we take for granted wouldn’t have been available to Medieval people. Potatoes weren’t grown in Europe until the 1600s. Fresh citrus fruits, like oranges and lemons, could be shipped across from Spain or Southern France – but would be real luxuries. Bananas were, of course, out of the question. Even maize wasn’t grown in Europe until the 1600s. Nowadays, we have a huge amount of sugar in our diets. But, until the mid 1500s, few Europeans would have ever have tried the sweet stuff. Instead, they sweetened foods with honey. Alternatively, they might have used spices, herbs or dried fruits to add a little bit of taste. Medieval food could often be very heavily spiced and they didn’t make the same distinction we do between sweet and savoury courses. The flavours were mixed in many dishes, and a meal wasn’t structured so you had a main and then a dessert. But Medieval people did enjoy a couple of things that we don’t have today. Medieval people would have enjoyed many more varieties of apples and pears than the supermarkets stock nowadays. In the summertime, they had the opportunity to forage for blackberries and wood-cherry. 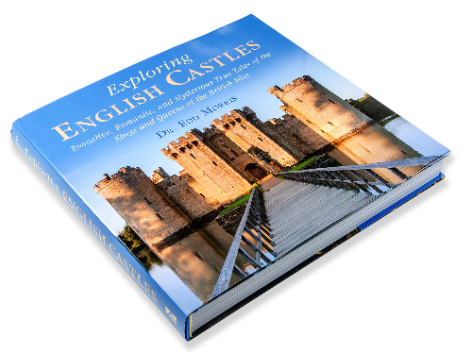 If you’d like to learn more about life in a Medieval castle – everything from grand, cold rooms to smelly toilets – click here. From roast peacock to whale vomit, discover Medieval food and drink. 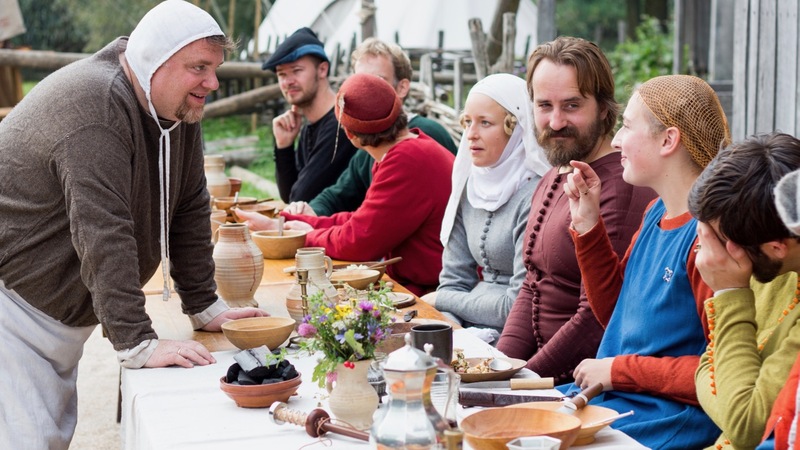 Uncover the diets of Medieval nobles and peasants, all washed down with gallons of ale.